There are hundreds, perhaps thousands, of retellings concerning King Arthur, Guenever, Merlin, Lancelot, the Knights of the Round Table and the Kingdom of Camelot, but only a few of them attain literary quality and even less become classics. T.H. White’s four-part masterpiece (or five-part, depending on what edition you have) definitely falls into the elite category. With oddly chatty and anachronistic prose, which describes Sir Ector as drinking port and discussing Eton before explaining that he’s only using these terms because “by mentioning the modern it is easier to give you the feel,” White moves from comedy and satire to grandeur and tragedy, with each book getting successively darker as they follow Arthur’s growth from childhood to old age. Likewise, White extensively draws upon quotes and ideas from other scholars and writers on the Arthurian subject, such as Shakespeare, Chaucer, Geoffrey of Monmouth, Milton, Tennyson, and especially Malory, who in fact makes a sort-of cameo at the conclusion of The Candle in the Wind. It makes for a strangely personal narrator, one who addresses the reader directly and who can go off on several tangents, creating a challenging style that’s initially hard to grasp. The story begins in The Sword in the Stone, set in a castle within the Forest Savauge, where a young boy called Arthur (but better known as “The Wart”) enjoys his idyllic childhood under the care of his foster-father Sir Ector and with the company of his foster-brother Kay. 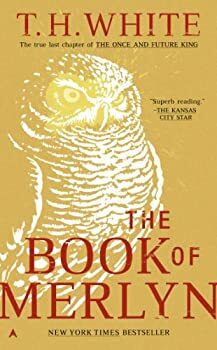 After following an escaped hawk out into the forest, Arthur stumbles upon the forgetful but immensely powerful Merlyn, an enchanter who returns to the castle as his new tutor. For the next six years Merlyn oversees Arthur’s education by sending him on several adventures (including one with Robin Wood — and yes, that’s spelt with a W — and his Merry Men) and turning him into various animals in order to learn the wisdom of the natural world. By the time we get to the scene that everyone knows about, in which Arthur pulls out a certain sword from an anvil in a churchyard, the fruits of his education pay off in an exceptionally beautiful way — one that the well-known Disney adaptation doesn’t even come close to capturing. The story continues in The Witch in the Wood (more recently titled The Queen of Air and Darkness) in which we’re introduced to the Orkney brothers and their mother Morgause, who are to have a profound effect on future events. The majority of this particular book feels like setup and foreshadowing for the following volumes, in which three bumbling knights arrive in Orkney, the brothers partake in a unicorn hunt, Arthur strategies for the Battle of Bedegraine, and Mordred is conceived. Despite the fact that The Sword in the Stone is White’s most famous book, it is my opinion that The Ill-Made Knight is his finest instalment in the series, focusing on Sir Lancelot and including that knight’s moral struggles, his love affairs with Guenever and Elaine, his wandering in the wilderness as a mad man, the quest for the Holy Grail, and the gradual encroachment of shadows upon Camelot. Envisioning Lancelot as a misshapen and ugly fellow, who fights his sadistic tendencies with gentleness and courtliness, torn in two over his devotion to Arthur and his passion for Guenever, and following his faith to the very ends of the world, The Ill-Made Knight is White’s masterpiece. Dreamy and poetic, poignant and heartrending, funny and romantic, this story contains what is probably the finest character study of the three main players in any Arthurian retelling. The Candle in the Wind tells of the fading glory of Camelot and the destruction of the Round Table, in which Lancelot’s betrayal and Guenever’s adultery are brought out into the open thanks to the designs of Mordred. With one vendetta following another, the end of Arthur’s glorious reign swiftly approaches. The final segment, The Book of Merlyn, (not included in all volumes) is a mixed bag. More of an essay than a story, Arthur revisits Merlyn and his animal friends before his death for one last debate over the nature of mankind and its tendency to war. Originally rejected by the publishers, it was eventually published posthumously, and there are some inconsistencies that may frustrate the reader. When White revised The Sword in the Stone for its inclusion in a collected work, he added segments from The Book of Merlyn, namely Arthur’s transformation into an ant and a wild goose. These episodes are therefore repeated in this final epilogue, in which Arthur experiences these transformations as an old man. The text is almost exactly the same, which presents the problem of whether to read it or not. On the one hand, The Candle in the Wind is a powerful and fitting ending to the saga, but The Book of Merlyn (despite its confusing repetition), contains several beautiful passages pertaining to Arthur’s weariness as well as the long-sought for reunion between Arthur and Merlyn. In my opinion, the ant and goose transformations are more meaningful when experienced as an old man than as a youth, not to mention what the author originally intended, though it does mean that there are some discrepancies considering that in previous books Arthur recalls these experiences taking place in his youth. Confused yet? Perhaps it’s best finish to with The Candle in the Wind, or at least take a break before reading The Book of Merlyn. In every version of an Arthurian retelling, it is interesting to note what each author uses as his/her themes and what characters he focuses on. Here, the key characters are Arthur, Lancelot, and Guenever, with Merlyn and Gawaine as supporting characters, followed by Mordred and Galahad. Morgan le Fay and Nimue’s appearances barely constitute a cameo, and concepts such as the Lady of the Lake and Excalibur are not mentioned at all. After playing a considerably large part in the first book, Kay drops out of the story entirely, as does King Pellinore, who is given a rather large subplot in the first two books as he searches for the Questing Beast. More surprisingly, the likes of Robin Hood, Marian, Friar Tuck, Little John, and Much enter the story — perhaps somewhat anachronistically — and are never seen again after the first book. Even more interestingly, Camelot itself is of minor importance. Although many stories present it almost as a character in itself that embodies Arthur’s ideals, here the destruction of Camelot is far less intense than the destruction of the characters, especially regarding the failure of Arthur’s life’s work. It’s hard not to love and admire White’s rendering of Arthur, Lancelot, and Guenever. In recent publications, I have become increasingly annoyed at the characterization of these three characters. I cannot stand Marion Zimmer Bradley’s portrayal of a selfish, simpering Guinevere; nor Rosalind Miles’s blustering, boorish Arthur; and even the likes of Rosemary Sutcliffe and Thomas Malory, who adequately retell the barebones of the story, simply don’t have enough room to offer insight on what’s going on in the characters’ heads. But even though I’d never read White’s work before, I felt as though I was reading these three characters as I’d always imagined them in my mind: flawed, but inherently noble and loving. Arthur is honest, open-minded, modest, optimistic, and yet carries the weight of the world on his shoulders. Sir Lancelot strays far from the usual ideal of him as the handsome, charming knight – here he is tortured, complicated, and religious; both a lover and a fighter with a deep inferiority complex. Then there’s raven-haired Guenever: the best and the worst thing to happen to each man. Far from reviling her as an adulteress, White commends her for the strength of her love: “You could pretend that Guenever was a man-eating lion, or that she was one of these selfish women who insist on ruling everywhere. But she was not promiscuous. There was never anybody in her life except Lancelot and Arthur. She gathered her rosebuds while she might, and the striking thing was that she only gathered two of them, which she kept always, and that those two were the best.” Because White was more comfortable writing male characters, Guenever remains rather enigmatic and one is never quite sure why Arthur and Lancelot love her so deeply. Nevertheless, there is a mystery and softness about the woman that draws you in, convincing you of their love even if it cannot be fully understood. Although Arthur himself is entirely legendary, White presents a powerful statement on the thought that the ideas attributed to him reshaped English society, moving it out of the Dark Ages and into chivalry and civilization, where Might is not Right, and law and order become powerful tools in themselves. As such, the central themes of the novels are the search for antidote to war, and to observe the politics of man through the animal kingdom. Rather than the usual portrayal of Arthur as a warrior-king, he is an innovative thinker who breaks the rules of warfare in order to bring it to a halt, to control the violence of men by channelling it into good deeds, and then coming up with the idea of the search for the Holy Grail after the knights turn to bloody sportsmanship after peace (and stagnation) is declared. It is important to keep in mind that much of this was written during WWII, lending White’s treatises on the subject a sense of bitterness, passion, and hope that they may not have otherwise contained. The best books are those that make you feel older and younger for having read them; those that you can tell the author threw their heart and soul into; the ones that make you feel as though you’ve been given a new perspective on the world. I don’t say this about many books, but White’s strange, sad, disjointed, poetic, joyful, humorous, challenging saga falls into all these categories. I’m just annoyed at myself that it took me this long to read it. The Once and Future King — (1938-1977) The Once and Future King is the omnibus edition of T.H. White’s four novels about King Arthur: The Sword in the Stone (1938), The Queen of Air and Darkness (aka The Witch in the Wood) (1939), The Ill-Made Knight (1940), and The Candle in the Wind (1958). The Book of Merlyn is “The Unpublished Conclusion to The Once and Future King.” Publisher: T.H. White’s masterful retelling of the Arthurian legend is an abiding classic. Exquisite comedy offsets the tragedy of Arthur’s personal doom as White brings to life the major British epic of all time with brilliance, grandeur, warmth and charm. I love Authurian legend, in fact, King Arthur stories were some my first readings of the fantasy genre. But most the stories I enjoyed leaned more toward historical fiction. I’ve never read The Once and Future King, but I’ve wanted to, well sorta. I find a lot of literary classics to be rather dull and/or too dated. So I’ve always shied away. Maybe I need to reconsider these? Right. I understand that, and it’s probably me, but sometimes books that are considered great literary classics, just read really dry. Like say, Alexander Dumas for example, I love the movie versions of The Three Musketeers, The Man in the Iron Mask, and The Count of Monte Cristo, but I don’t think I’d get too far reading the books. I know it’s like sacrilegious for fantasy fan to say this; while I love the LOTR movie trilogy, reading the books was no where near as fun for me. Greg, this here is coming from a kid with the attention span of a gold fish (and who can hardly put up with as much ‘dry-ness’ as one), The Once and Future King is quite entertaining : ) (imo, if that hepls at all.) And I’m in complete agreement with you about the Three Musketeers and The Count of Monte Cristo, : D. Good movies ! Thanks Caitlinn, I’ll definately put this on my TBR list. Its been a while since I’ve read a good Arthurian Legend. It’s kinda messed-up, me being a fan and never having read one of the greats anyway. Greg, I once had the same problem. 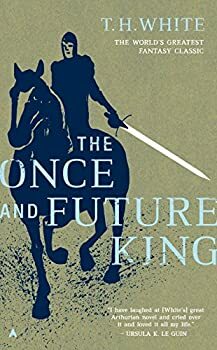 The Once and Future King was the first classic I read and enjoyed from beginning to end. After that, I became a classics fan. It’s very different from reading modern lit, but once you can accustom yourself to the types of writing that were popular in each era, they can be as un-put-downable as any other book. Also, regarding Dumas, the translation may have been the problem. After I saw the movie in the 90s, I read the book and not only was it much more thrilling, it was much more racy! Fantastic review, Rebecca! And you are spot-on about book 5. Better to end with book 4 and then leave book 5 to read as another book.